AIRPOXY is a 3 ½ year Large Scale collaborative project coordinated by CIDETEC within the Call H2020-MG-2017, in the H2020 framework. The AIRPOXY project will reduce production &manteinance costs of carbon composite parts in aeronautics by introducing a new family of enhanced composites. 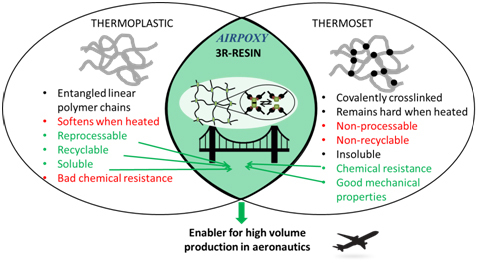 The aim of AIRPOXY is to reduce the production and maintenance costs of composite parts in the aeronautic sector by introducing a novel family of thermoset composites that preserve all the advantages of conventional thermosets, but can also be easily processed and repaired, and even recycled. This is now possible thanks to a family of ground-breaking thermoset resins recently invented and patented by CIDETEC which present reversible or “dynamic” bonds. These dynamic chemical bonds enable a series of “smart” properties, creating a new generation of thermoset composites that preserve their high performance, in terms of easy fibre impregnation and overall stability, while showing new unprecedented features once the composite is completely cured, such as Re-processability, Reparability and Recyclability, called “3R”. These technologies are currently in a state of applied research (TRL3). - SO1: New family of 3R resins adapted for aeronautics from TRL3 to TRL 5. - SO2: Reduction of current costs/ times for manufacturing thermoset CC parts. - SO3: Reduction of the current costs/times for MRO associated to the repair or replacement of thermoset CC parts. - SO4: Reduction of the costs of adhesive bonding of thermoset CC and increase in their robustness. - SO5: Quantification of the environmental advantages of the recyclability of the 3R CC parts at the end of life (EOL) vs traditional CC parts, using Life Cycle Assessment (LCA) & Life Cycle Cost (LCC) methodologies. efficient, affordable and deep refurbishment by a factor of 2 to 3 times the current rate. - SO6: Ensuring dissemination & suitable exploitation. AIRPOXY relieson a multidisciplinary consortium of 11 partners from 6 different European countries (Belgium, France, Germany, Ireland, Spain and Greece), and will cover the whole value-chain to solve manufacturing process cost-effectiveness problem. AIRPOXYproject brings together a strong consortium made up of the inventors of the resin (CIDETEC), key technology providers (IVW expert in thermoforming and welding of thermoplastic composites; Eurecat expert in RTM process; Coexpair expert in SQRTM process; Univeristy of Ioannina expert in SHM; Altair expert in process simulation software), manufacturers of aircraft components (EIRE, IDEC, SONACA) together with standardization experts (UNE) and an aero-consultancy (Arttic). They will be supported by a strong advisory board with relevant representatives from OEMs (AIRBUS and Leonardo), material industry (Huntsman and SGL group) and aeronautical organizations (EREA, through its Spanish representative from INTA). - Formulation of 3R adhesives for aerospace applications. - Fabrication and characterization of 3R aerospace composites. - Development of the 3R adhesive bonding process. - Support the industrial partners regarding 3R technology.